Welcome to the Roo Theatre Company, Home of the Performing Arts. 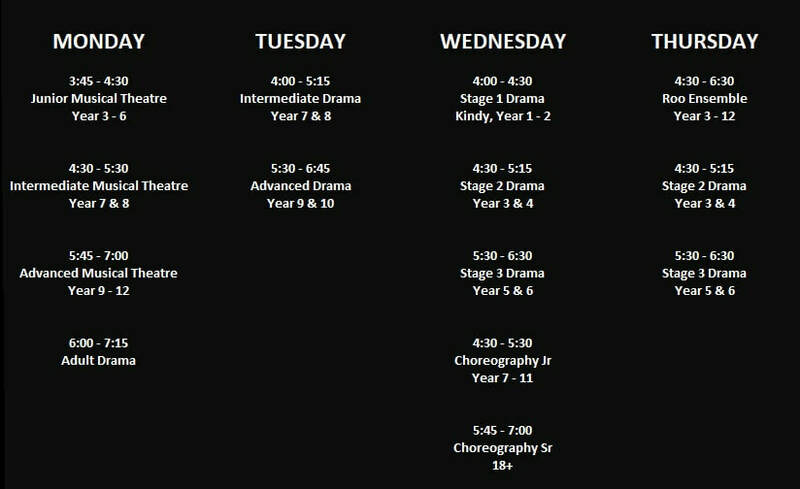 Classes will commence Monday 4th of February and continue for the next 10 weeks (per school term). We ask that students of the Drama School wear comfortable and appropriate clothing, as some activities involve physical movement. Closed shoes are essential as we often work on the stage - any students without closed shoes will not be permitted onto the stage. All of our classes are strictly closed classes, which means only the students may enter the class room. We hold open days through out the Semester (2 terms) and have an end of year showcase where parents / family can see what the students have been working on. We are very excited for a great year of Drama, Musical Theatre, and Dance tuition, and we look forward to working with each and every one of you. Please remember, we are a Drama School and are all experienced and qualified to deliver the best results, and unfortunately due to previous years, any difficulties that may arise in the classroom with students will result in a suspension or a transfer of classes/tutor. What do I need to bring …??? All Student Registration forms must be filled out and returned to the office ASAP, these can be found on the Classes Home Page by clicking the button below.